This is the Part 2 of our story The Deadly 7 AM. For Part 1 please click here . 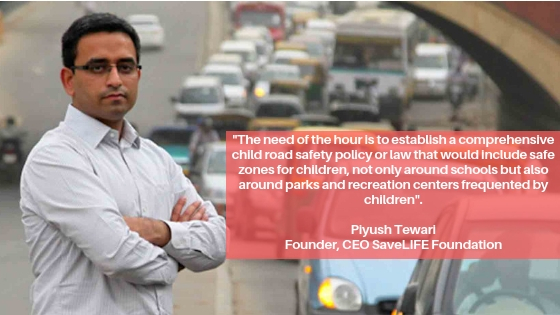 Offdhook in conversation with Mr. Piyush Tewari, founder and CEO of SaveLIFE Foundation, India. There has been a long debate around school zones safety measures so where exactly are we failing? Is it the problem of implementing rules and guidelines by the schools or awareness among the school commuters? While there has indeed been some talk about demarcating an area around the school as a “School Zone” for enhanced safety measures, there is no policy or law at any State or Central level to define what such a policy would entail. The need of the hour is to establish a comprehensive child road safety policy or law that would include safe zones for children, not only around schools but also around parks and recreation centers frequented by children. The law must be combined with implementation measures such as third-party safety audits to be undertaken by a professional agency. The strictness being maintained by schools to have everyone on time is justified? Or some leniency by schools will not let parents to drop their kids at the sake of their life? A serious challenge with child safety in India is missing adult accountability. Whether it is a parent or a bus/rickshaw driver, the law doesn’t hold the adults accompanying children directly accountable for their safety, or the lack of it. We often see parents and drivers speeding despite children being on board. Children are almost always left unsecured in the car and without a helmet on two-wheelers. Once strict measures are put in place to address such negligent behavior by parents or other adults accompanying children, we may be able to address the lax attitudes more decisively. Similarly, school buses regularly flout Supreme Court guidelines on school buses but there’s rarely any prosecution of the schools or the bus owners. Flying squads of traffic police aimed at booking grave negligence during transportation of children will also help address the menace. Every child has a right to live a safe life in a safe environment but looking at the traffic congestion around schools I get jitters. The whole chaos around schools scares me. Do you think we can ever find a solution to this problem which has pertained for decades in cities. In the West, schools have safety committees composed of parents who volunteer to manage traffic and child safety outside and around schools. Such a system must be encouraged in India as well so that safety of children just outside their schools can be addressed with a partnership approach. Do you think the mushrooming growth of private schools will lead to a much bigger problem if not controlled on time? The problem is lack of safety standards for commute of children and weak implementation of even existing basic traffic laws when it comes to children. Unless we have a framework that can define the standards, most interventions will remain temporary in nature. SaveLIFE Foundation has been demanding the passage of the Motor Vehicle (Amendment) Bill, 2017 in the parliament for several years now. The Bill introduces several missing standards for child safety. Unfortunately though, the Bill has not figured in the list of priorities of either the government or the opposition, leading to dozens of children getting killed on our roads every day.